We continue our exploration of the most sacred foods for fertility. These foods represent nutrient-dense solutions for couples who are struggling to conceive, planning to conceive and for mothers who wish to nourish her child in the womb. Prior to the advent of industrial agriculture and the processing of food, these foods for fertility held a sacred place in the human diet. Part One of the series taught you everything you need to know about Chia Seeds, Part Two was about one of my favorite superfoods for fertility, Maca, and today is all things Egg Yolks! What makes Egg Yolks so good for fertility? Egg yolks can honestly be considered “nature’s multivitamin”. The egg yolk supplies almost all of the whole egg’s iron, calcium, zinc, vitamin B-6, folate and vitamin B-12. It also contains 100 percent of the egg’s vitamin A, which includes two antioxidant carotenoids – lutein and zeaxanthin. Egg white omelets and other yolk-free recipes have become synonymous with “healthy” to many people. But if you toss out your egg yolks, you’re also tossing out the most nutritious parts of the egg. 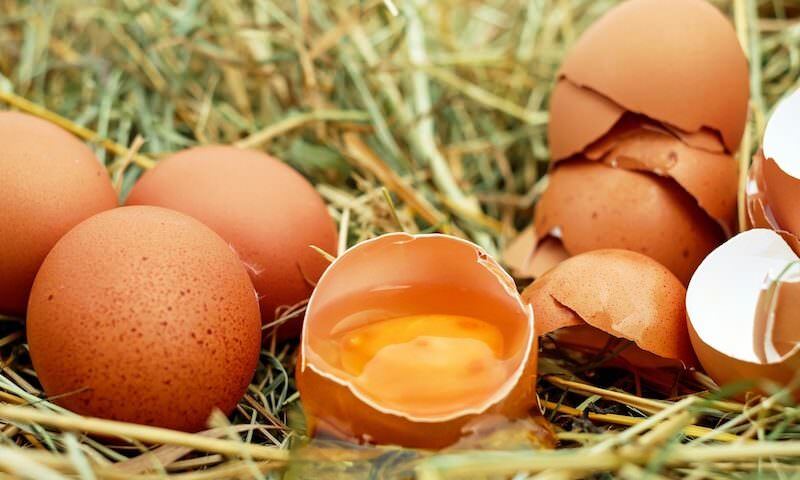 Egg yolks from PASTURE-RAISED chickens are extremely rich in fertility boosting omega-3 fatty acids EPA and DHA; the fat soluble vitamins A, D, E, and vitamin K2 – which is very important in forming healthy bones, quick blood clotting, and regulated menstrual cycles. But they are especially rich in a nutrient many people have never heard of: choline – which is essential for proper development in fetuses. Choline is of particular importance to the preconception and pregnancy diet as requirements for the developing nervous system. Most pregnant and lactating women are not consuming adequate choline for their developing babies and researchers are calling for increased consumption of choline-rich foods among pregnant and lactating women. Studies suggest that 86% of women don’t get enough choline in their diet. This is significant because choline helps protect against neural tube defects. Choline is particularly critical in tooth development as well as brain development. A mother’s intake of choline during pregnancy may improve the capability for memory in her child. Beyond an essential role in brain development and the capacity for memory, promising studies found that maternal intake of choline might significantly decrease cognitive dysfunction seen in Downs Syndrome, at least in mice. It should be noted that it’s super important to consume eggs from organic, pasture-raised chickens, and here’s why: egg yolks from pasture-raised chickens contain up to TWENTY TIMES more healthy omega-3 fatty acids, than those from factory raised chickens. Check out my blog post about The Importance of Choosing Toxin-Free Food to find out more! * Proteins are nutrients that are essential to the building, maintenance and repair of your body tissues such as your skin, internal organs and muscles. They are also the major components of your immune system and hormones. How do I consume Egg Yolks? Eggs can be fried, scrambled, boiled, poached, served with greens or in frittatas brimming with vegetables. Alternatively, consider mixing them into soups or in smoothies. You can even hard boil eggs for egg salad! The list goes on and on. Because there is a high amount of unsaturated fats in the egg yolk (read: fragile fats with a low heat tolerance), it’s best to not overcook egg yolks. It’s important to consume egg yolks that are only lightly cooked, as the heat will damage many of the highly perishable nutrients in the yolk. Two raw egg yolks have antioxidant properties equivalent to half a serving of cranberries (25 grams) and almost twice as many as an apple. But the antioxidant properties are reduced by about 50 percent when the eggs are fried or boiled, and reduced even more if they’re microwaved. If you prefer cooked eggs, it’s best to cook them in water – soft boiled, poached or sunny side up with very runny yolks. If you’re going to fry them, just be sure to keep the heat very low and don’t overcook. If you like hard boiled eggs, just be sure the yolks stay translucent and don’t become gray and chalky. This is a sure sign of overcooked yolks and oxidized cholesterol. The very best way to consume egg yolks is RAW. Yep, you read that right. Like Rocky Balboa style. As long as you’re choosing high quality, pastured egg yolks, there is no need to worry about salmonella. Raw egg yolks are incredible emulsifiers, helping smooth out sauces and smoothies. They taste great, providing a nice creamy mouthfeel to dishes while smoothing out any bitter tastes. For those of you who don’t like to eat eggs but still want the amazing benefits, I have a sneaky trick up my sleeve … add raw egg yolks to your smoothie! The raw yolks blend right up, and you’ll never even know it’s in there. I’ve included one of my favorite Fertility Superfood Smoothie recipes – as long as you keep the base ingredients the same, you can customize it as much as you like. * Water, coconut water, raw milk, homemade nut milk, bpa-free canned coconut milk, kefir, or yogurt. If using coconut milk, only add ¼ cup. 1½ tbsp whole chia seeds soaked in 2 cups water beforehand until a thick gel forms. This is where you can get creative! Top off your smoothie with any of the additional ingredients below. Feel free to get crazy and mix and match to get the flavor that you want! Place all ingredients into blender, blend until desired consistency and enjoy! What is your favorite egg-based recipe? Do you put egg yolks in your smoothies? DO IT! This is especially great for people who don’t like the taste of eggs. Have you tried raw egg yolks? Love / hate? Spread some Egg Yolk lovin’! Sharing is caring, and I bet you have some friends who would love to read this too :).